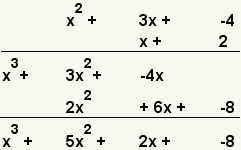 Multiplication of Polynomials: Multiplication of each of the terms of two polynomials. Multiplication of polynomials consists of multiplying each of the terms of the two polynomials, then adding the like terms. The degree of the resulting polynomial is the sum of the degrees of the polynomials being multiplied. The factors of the resulting polynomial are each of the factors of both polynomials being multiplied. 2 Write the polynomials one under the other. 3 Multiply the first term of the first polynomial and the first term of the second polynomial. 4 Multiply the second term of the first polynomial and the first term of the second polynomial. 5 Multiply the third term of the first polynomial and the first term of the second polynomial. 6 Multiply the first term of the first polynomial and the second term of the second polynomial. 7 Multiply the second term of the first polynomial and the second term of the second polynomial. 8 Multiply the third term of the first polynomial and the second term of the second polynomial. 9 Add the like terms of the products. McAdams, David E. Multiplication of Polynomials . 12/21/2018. All Math Words Encyclopedia. Life is a Story Problem LLC. http://www.allmathwords.org/en/m/multiplicationofpoly.html.